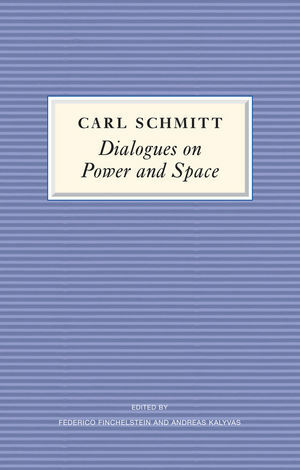 Written in the early stages of the Cold War by one of the most controversial political and legal thinkers of the twentieth century, Carl Schmitts two short dialogues on power and space bring together several dimensions of his work in new ways. The dialogues renew Schmitts engagement with the questions of political power and geo-politics that had been a persistent concern throughout his intellectual life. As a basis on which to think through the historical role of human agency in relation to power and its new geographies, the dialogues condense and rework key concepts in Schmitts political theory during a transitional period between his Weimar and fascist years to the post-war writings. In this book, Schmitt develops a new dialectics of modern power and an original understanding of the global spatial transformations of the Cold War period. Equally important, the dialogues anticipate the debates on the new geo-political possibilities and threats related to cosmic spaces, overpowering technological advances, and the existential predicament of the human in an increasingly multipolar world. Carl Schmitt (1888-1985) is widely acknowledged to be one of the most important and influential political theorists of the twentieth century. His many works published in English include The Concept of the Political, Political Theology, Writings on War and On Dictatorship. "These short dialogs, written in the 1950s when Carl Schmitt was no longer center stage, are primers on two essential themes of his thought: the inescapable reality of power that cannot be normatively wished away; and the spatial shift from a terrestrial to a maritime view of the world, which unleashes the total mobilization of technology that shapes global modernity."